Rabbits reproduce quickly and with abundance, while elephants do so slowly and infrequently; this is a metaphor for the church. The established institutional church is likened to the elephant, while the house church is compared to a rabbit. Noting that house churches (also called simple churches, organic churches, or missional churches) can be started easily and at little expense, they are an effective way of making disciples. Making disciples, the authors point out, is what Jesus told his followers to do; he did not say go and plant churches, or even go and convert people, but simple to go and make disciples. The Rabbit and the Elephant is filled with practical teaching on house churches, which is backed by solid support from the Bible. To add relevance and make for a convicting and compelling read, ample personal experiences of the authors are included to illustrate points and put real faces on the principles they share. The purpose of the kind of house church they advocate is not merely to be internally focused, for the benefit and comfort of its members, but for outreach. The house church is essentially to be evangelistic, making disciples in the process. Towards this end, a simple, nonthreatening, non-confrontational method is offered. 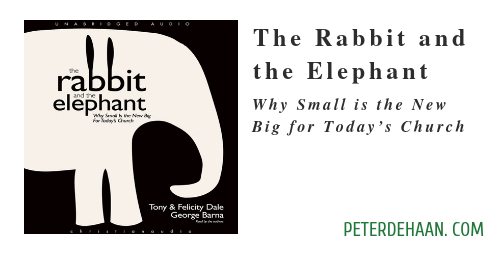 The Rabbit and the Elephant contains 23 short and concise chapters, which effectively build on each other. It also contains a helpful appendix answering commonly asked questions and even the endnotes contain useful insights. The Rabbit and the Elephant is a “must read” for anyone in or pursuing a house church—or for those in a traditional church yearn for more.